Discount available! Recommend Universal GSM Shield to your friends and get your Discount. Universal GSM shield for Arduino and Raspberry Pi. 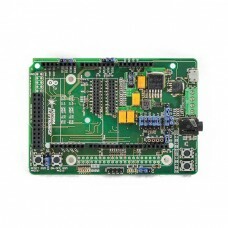 It supports various GSM / GPRS modules such as SimCom, Quectel and Fibcom mounted on a breakout board (see related products). These cards are all equipped with the same pin out, it is therefore possible to interchange them to find the one most suitable for your application, develop the firmware on the shield and then integrate the chosen module into the final circuit. The shield allows you to take advantage of the voice call and SMS exchange functions, the management of GPRS data connections and, for the modules that support it, also the GPS. The GSM shield is equipped with an audio jack to which a standard telephone headset can be connected. It includes strips dedicated to debugging useful for monitor the commands exchanged between boards (Arduino or Raspberry Pi) and the GSM module (with a USB / Serial converter - See related products). Provides buttons to turn on and reset the module manually. 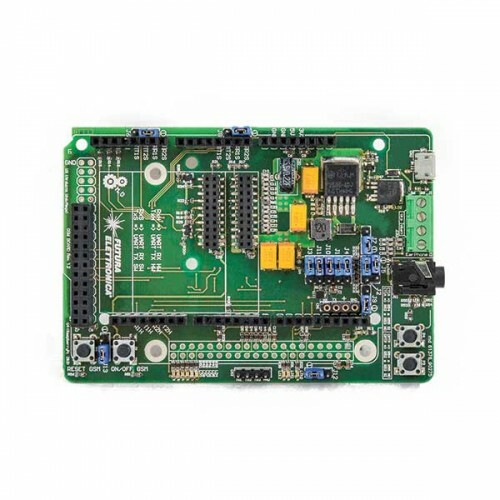 The GSM shield must be powered by the microUSB connector in order to be able to independently manage the GSM module power supply and support any absorption peaks due to the transmission of the module. In fact, there is a power regulator capable of supplying up to 3A. For this shield a library has been developed capable of exploiting all the functions of the various GSM modules, allowing them to be managed without knowing the syntax of the AT commands. The library is designed to do most of the work and leave the task easier for the developer, who will simply have to adapt the library to his own needs and those of his applications. Thanks to the extensive set of commands it is possible to initialize the module, send and read SMS, make and receive voice calls, manage the phone book, manage security parameters (such as the SIM card PIN) and make data connection to obtain information from the internet and to send data to the cloud.